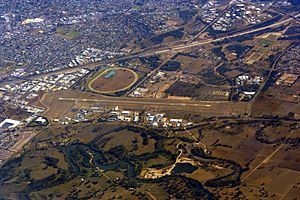 Albury /ˈɔːlbəri/ is a major regional city in New South Wales, Australia, located on the Hume Highway on the northern side of the Murray River. It is the seat of local government for the council area which also bears the city's name the City of Albury. 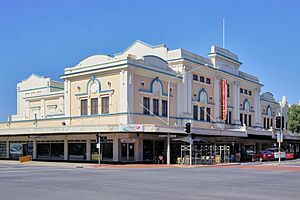 Albury has an urban population of 51,082 and is separated from its twin city in Victoria, Wodonga by the Murray River Together, the two cities form an urban area with an estimated population of 89,213.< It is 554 kilometres (344 mi) from the state capital Sydney and 326 kilometres (203 mi) from the Victorian capital Melbourne. The first European buildings erected at the crossing place were a provisions store and some small huts. A survey for a town was commissioned in 1838 by Assistant Surveyor Thomas Townsend who mapped out Wodonga Place (the present Wodonga Place) as the western boundary, Hume Street as the northern boundary, Kiewa Street to the east and Nurigong to the south, with Townsend Street being the only other north-south road, and Ebden and Hovell Streets being the other two east-west roads. Townsend proposed the settlement be named 'Bungambrewatha', the Aboriginal name for the area, but when his plan was eventually approved and published in the Government Gazette on 13 April 1839 the name had been changed to Albury. Albury was at this time starting to grow substantially with German speaking immigrants using the area to grow grapes for wine. By the 1870s a butter factory was established, a flour mill, wineries and locally brewed cider and soft drinks were available. The railway line from Sydney arrived at Albury in 1881 (see Transport-Rail below). A temporary wooden railway bridge joined the line to the Victorian network in 1883. New South Wales and Victoria had different track gauges until 1962, when the first train ran direct from Sydney to Melbourne. The States could not initially agree which should be the transfer point so they had an expensive and attractive iron lattice bridge sent from Scotland which accommodated both gauges. The bridge is still standing astride the Murray and is in daily use. In 1888, Albury built its first school house. The city's first mayor James Fallon was an innovator of the Public School, funding a demonstration High School to be built on Kiewa Street. 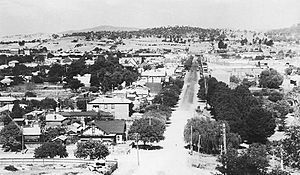 The Royal Commission on Sites for the Seat of Government of the Commonwealth report of 1903 recommended Albury (along with Tumut) as the preferred candidate for the national capital, though the proposal met staunch opposition from residents. At a public meeting, just one member of parliament voted in favour of Albury – Isaac Isaacs, member for the Indi. The lack of support for other places ultimately led to the selection of Canberra as the preferred site. In 1934, a Douglas DC-2 airliner of KLM (the "Uiver"), a competitor in the MacRobertson Air Race (also known as the London to Melbourne Air Race), made an emergency night landing at the town's racecourse after becoming lost during severe thunderstorms. After signalling by Morse code A-L-B-U-R-Y to the lost aircrew by using the entire town's public lighting system, the "Uiver" was guided in to land safely. The makeshift runway at the racecourse was illuminated by the headlights of cars belonging to local residents who had responded to a special news bulletin on ABC Radio 2CO. 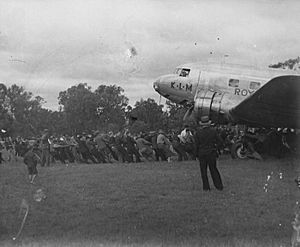 After refuelling the next day, many local volunteers helped pull the stranded aircraft out of the mud and the aircraft was able to take off and continue to Melbourne where it won first prize in the race's handicap category and became second overall. Albury and Wodonga played a military role in World War II with the establishment of ordinance bases at Bandiana and Bonegilla. Proclaimed a city in 1946, Albury and played a role in the post-war immigration to Australia with the establishment nearby of Australia's first migrant centre, the Bonegilla Migrant Reception and Training Centre in 1947. Albury's proximity to Wodonga has spurred several efforts to achieve some kind of municipal governmental union (see Albury-Wodonga). In 1973, Albury-Wodonga was selected as the primary focus of the Whitlam federal government's scheme to redirect the uncontrolled growth of Australia's large coastal cities (Sydney and Melbourne in particular) by encouraging decentralisation. Grand plans were made to turn Albury-Wodonga into a major inland city and large areas of the surrounding farmland was compulsorily purchased by the government. Some industries were enticed to move there, and a certain amount of population movement resulted. However, the current urban population is approximately 88,949. 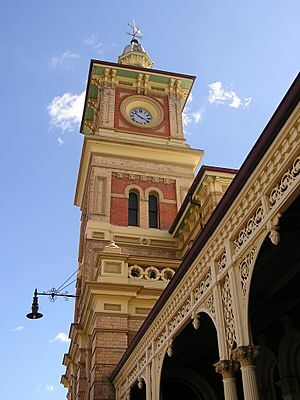 Albury has a large number of heritage buildings. The following are listed on the Register of the National Estate. Albury has a warm, temperate climate, with cool to mild winters and very warm to hot summers. 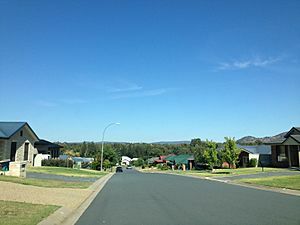 Under the Köppen climate classification, Albury has a humid subtropical climate (Cfa). In summer, the mean daily maximum temperature is 30 °C (86 °F) with low humidity; however, this is subject to substantial daily variation. An average of 17 days with a maximum above 35 °C (95 °F) occur in this summer period. Mean winter maximums are 14 °C (57 °F) with many crisp, sunny days. Frosts are commonplace in winter, with approximately 20 days per year featuring minimums of below freezing. Albury's mean annual rainfall is 701.3 millimetres (27.61 in), which is more than Melbourne but less than Sydney. Rain can occur all year round, but most of it falls in the winter months with July's high mean of 82.3 mm (3.24 in) comparing with the March low of 37.9 mm (1.49 in). Albury has quite a high evaporation rate, giving the environment a more arid look compared to drier cities like Melbourne, with the city enjoying a high amount of sunshine annually. Albury gets around 108 days of clear skies annually. The city comprises a number of suburbs. Central Albury comprises the central business district (CBD) and lies between the railway line, the Murray River and Monument Hill. Much commercial activity is concentrated here, with Dean Street forming the axis of the main shopping and office district. A cultural precinct is centred on QE2 Square, including the Albury Library Museum, Albury Regional Art Gallery, Albury Performing Arts Centre and Convention Centre, and the Murray Conservatorium. In the same block are the Post Office, Police Station and Courthouse, and St Matthew's Anglican Church (which was rebuilt after being destroyed by fire in 1990). The Albury City Council offices are located on Kiewa Street. North Albury was once covered by orchards and vineyards in the first half of the 20th century, as was a swamp where the James Fallon High School now stands; after the Second World War housing development in the area increased and Waugh Road was extended from David Street to the "Five Ways" intersection at Union Road, which ascribes the border between North Albury and Lavington. The locality of Glenroy is adjacent to North Albury, west of the Bungambrawartha Creek, and housing was developed here in the 1970s, including a significant Housing Commission public housing estate. 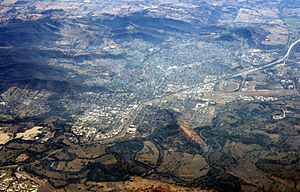 Thurgoona, to the east of Lavington, was established as a new residential suburb by the Albury Wodonga Development Corporation in the 1970s. In the 1990s a new campus of the Charles Sturt University was established here, as was an office of the Murray Darling Freshwater Research Centre. A major golf club (Thurgoona Country Club Resort) is also situated in this suburb. Lake Hume is situated on the Murray River 10 kilometres (6.2 mi) upstream of Albury. The Hume Dam (colloquially termed the Weir locally) wall construction took 17 years, from 1919 to 1936. A hydro-electric power plant supplies 60 megawatts (80,000 hp) of power to the state grid. When full, the lake covers 80 square kilometres (31 sq mi). The lake was created for irrigation purposes and has caused significant changes to the flow patterns and ecology of the Murray River. Before the construction of the Hume Weir, flows in normal (non-drought) years were low in summer and autumn (though still significant overall), rising in winter due to seasonal rainfall and reaching a flood-peak in late spring due to snow-melt in the Murray and its tributaries' alpine headwaters. The flow is now effectively reversed, with low flows in winter and sustained, relatively high flows in late spring, summer and early autumn to meet irrigation demands, although the spring flood peak has been virtually eliminated. The water released from the base of the Hume Weir is unnaturally cold. This flow reversal, temperature depression, and removal of the spring flood peak, has led to the drying out and loss of many billabongs and has harmed the populations of native fish of the Murray River such as the iconic Murray Cod. 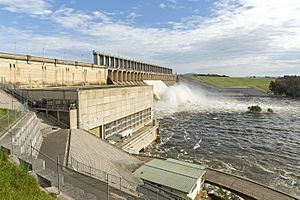 The Hume Dam recently was extended by State Water. The break of railway gauge at Albury was a major impediment to Australia's war effort and infrastructure during both World Wars, as every soldier, every item of equipment, and all supplies had to be off-loaded from the broad gauge and reloaded onto a standard gauge railway wagon on the opposite side of the platform. In his book Tramps Abroad, writer Mark Twain spoke of the break of gauge at Albury and changing trains: "Now comes a singular thing, the oddest thing, the strangest thing, the unaccountable marvel that Australia can show, namely the break of gauge at Albury. Think of the paralysis of intellect that gave that idea birth" (cited by Fischer below). Military armouries and warehouses were established in the vicinity of Albury. Similar stores were also established at Tocumwal and Oaklands. The conversion of the broad gauge track to a second standard gauge track, between Seymour and Albury, was substantially completed in 2011. In 2015 Murray Art Museum Albury (MAMA) was opened, formerly known as Albury Regional Art Gallery. The Gallery has 10 galleries with double the space. The Canvas Eatery is also attached facing onto QEII Square. Albury Facts for Kids. Kiddle Encyclopedia.